Vietnamese food is as colourful as the scenery and the people, with a diverse taste and style in each dish depending on its region. Food is a major part of life in the country, with their cuisine reflecting the culture and tradition and often implementing the five elements – wood, fire, earth, metal and water – in the local people’s authentic meals. The country is an experience that awakens all of your senses to the sights, smells, tastes, sounds and touch of a country brimming with life. And the food is no different. Before getting a real taste of Vietnam, understand the differences in the gastronomy across its three regions. Bordering China, the cuisine in northern Vietnam is heavily influenced by its larger neighbour. The use of chopsticks and bountiful selection of noodles are widely associated with the north, with stir-fry style dishes replacing rice which is more popular elsewhere in the country. “The seemingly infinite world of noodles in Vietnam, put against the near constant blur of passing motorbikes, optimises to me the love we have for Asian street food,” said Allan Wilson from Live Less Ordinary. The geography has shaped many of the foods in the north, with the cooler climes meaning that spices are less readily available. But there is no compromise on taste. Black pepper has a big impact, while the use of fish sauce and shrimp paste adds another layer. Back in the tenth century northern Vietnam was invaded by Mongolia, who brought with them beef amongst other things. Before, chicken and fish was the main ingredient in northern meals, but now the likes of Pho contain beef. For authentic meals then northern Vietnam is for you. The country’s culture originates from the mountains here and many of the ancient dishes are still created, with much emphasis on seafood and crab in particular. Pho – pronounced ‘fur’ without the ‘r’ – is quintessential Vietnamese cuisine in a bowl. The beef noodle soup is famous the world around and readily available across the country. Lime juice, bean sprouts, pepper and fish sauce are all available to garnish to taste. Made with ingredients that the northern parts of Vietnam are best known for, Bún Riêu Cua is a humble dish that is sure to satisfy. The crustacean flavoured soup is made from an abundance of thickly cut tomatoes, onions, rice-paddy crabs, rice vermicelli and crab fat. This is a warming, hearty dish that can be closely associated with the winter-evening stews that you are used to at home. Like Pho, Xôi is another dish available throughout the country with roadside vendors, luxury restaurants and locals all creating the balls of sticky rice. Xoi is a street food by origin, a simple dish that is best enjoyed on the streets as you explore the sights. Traditionally, Goi was reserved as a dish for special or significant occasions like birthdays or anniversaries. The salad is delicious and a far cry from the everyday green-leafed variety that we are so used to in the west. Notably sweeter and spicier than the cuisine on offer in the north, the food in southern Vietnam is light and smooth on the pallet. With waves of Cambodian and Thai flavours, the food is believed to be a reflection of a more laid-back way of life down here. Blessed with an open coastline bursting with an array of delicious seafood, the south incorporates a lot of grilled fish and crustaceans into their meals. This is the region for the freshest fish, squid, shrimp and prawns which are often accompanied with sweet coconut milk and sugarcane – a homage to the Thai influences. While the gastronomy of the north fits the weather, with warming stews and stodgy stir-fry, in the south you will have your choice of grilled fish and rice designed to be light and delicate in the heat. Before visiting the south, you may be forgiven for thinking that food was purely made for sustenance or energy. But now you are presented with happy dishes, happy faces and happy stomachs. The food here looks like it was prepared with a smile on the chef’s face. Few dishes reflect the richness of the local area’s natural resources better than the Canh chua. 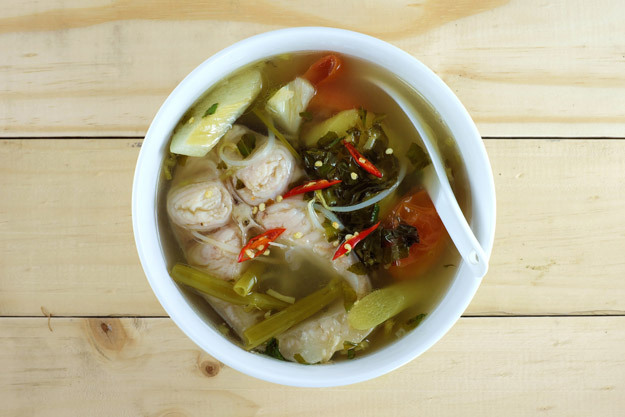 A tangy and beautifully balanced soup encapsulates the abundance of fruit and seafood in southern Vietnam. Fish, pineapple, tomato, bac ha (taro stem) rice and herbs all come together in a simple dish that knows what it is: hearty, tasty and soothing. 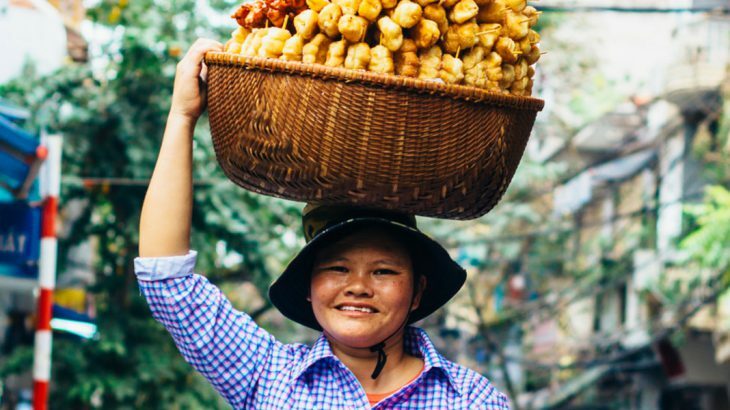 As well as the large dishes like canh chua and Bún Riêu Cua, the plethora of street food and snack in Vietnam means there is a huge amount of small bites to try. Bánh khot, small crispy savoury pancakes, can easily become your guilty pleasure while on a Vietnam holiday. The mini pancakes of rice, turmeric, herbs, coconut milk and topped with onions and a shrimp or prawn are often served with vegetables and a spicy/sweet dipping sauce. Crispy on the outside and soft in the middle, they are a speciality of the Ba Ria-Vung Tau province and are often eaten when rolled up in a lettuce leaf and dipped. The big cousin of Bánh khot, Bánh xèo are large savoury crepes filled with the finest tastes of Vietnam. More widely present in restaurants, they are often called the Vietnamese ‘pancake’. But you’ve never had a pancake quite like this. Packed full of meat, shellfish, fish, vegetables and herbs, choose from a variety of dipping sauces and you will never settle for lemon and sugar again. While the Chinese influence is felt in north and Thai in the south, the French’s impact on Vietnam remains in the cuisine in the centre of the country. 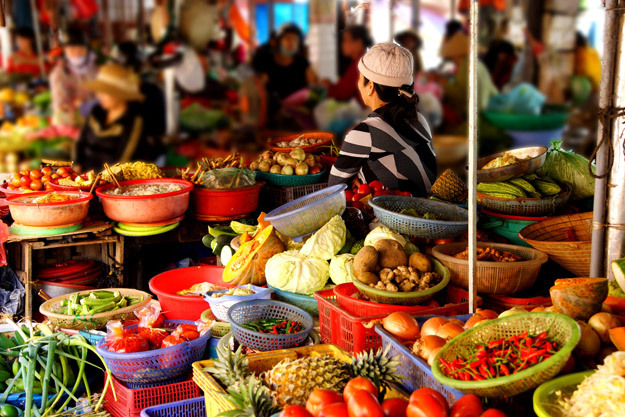 If you are doing a tour of Vietnam through its food alone, crossing from the north into the centre, you will be hit by wall of spice and tropical flavours in the most complex dishes across the country. Dishes are smaller here than the north, but what they lack in size they certainly make up for in taste and appearance. The colourful plates are complex and often come in a number of servings, with a selection of appetizers. You may find meals with an array of small portions presented sophisticatedly all at the same time. Take note of the change in style as well. Moving from the warming stews, you will be presented with lighter, brighter cuisine. Bánh Bèo is really Vietnam’s take on tapas. Cram packed full of flavour and served in small bowls, they are steamed rice cakes served with a selection of tasty bites and drizzling of sauce. The rice cakes themselves can be savoured individually, but Bánh Bèon really comes alive when chopped vegetables, shrimp, fried shallots, cubes of fried pork fat (tép mỡ) and fish or shrimp paste is added. This is one of the legacies left behind from the reign of Emperor Tu Duc from the imperial city of Hue, central Vietnam. This delicious little bowl is an eclectic array of flavours and textures and is a very popular mid-meal snack. Considered to be central Vietnam’s must-try noodle based dish, Mì Quảng is a thick and succulent dish with rich broth and wholesome noodles. One part salad, one part noodle soup, Mì Quảng has a rich meaty flavour, balanced with the crunchy vegetables and added spices. It is an iconic central Vietnamese dish synonymous with hearty street food in the area which once was reserved for the impoverished, and is now enjoyed by everyone across the world. The meat of the dish depends on where you choose to eat. If you go for the authentic, street-side experience then expect chicken or white fish, but in restaurants it may include pork or even beef. Named after its native province, Quang Nam, it is often served with crumbly rice crackers, dips and green side salad. As we have already noted, Vietnamese food has been distinctly influenced by China and one would imagine that Cao Lầu is a dish that has its roots firmly planted there. But that isn’t the case. Despite its Chinese style, the origin of the dish remains a mystery. The most authentic Cao Lầu comes from Hoi An, and cannot be replicated outside of the town. That is because the water used is drawn from the Ba Le well, dug by the Cham people, with a lye solution used in the preparation for the noodles comes from the trees on Cham Island. Ash from the burnt trees is then mixed with the water to give the noodles their texture and distinct hint of yellow. Cao Lầu is a real treat and represents centuries of trade and migration. Served with slices of roast pork, the thick noodles are seasoned and mixed with specific herbs, bean sprouts and greens. China’s influence is unavoidable from the architecture, to food, and to the introduction of Buddhism. The belief has developed a style of vegetarian cooking – an chay – which is widely regarded as one of the most sophisticated in the world. 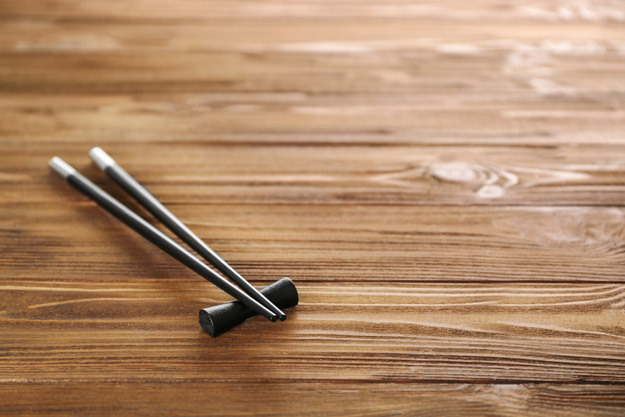 Elsewhere, the use of chopsticks has been widely adopted across the entire country, particularly the north, and has become a part of the mealtime custom in Vietnam. The country is poor and as such, the meals reflect that. 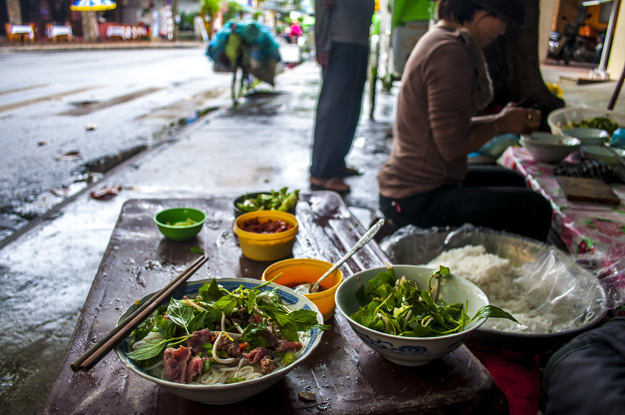 Cheap, quick and easy street-food is in abundance across Vietnam. But even in the sit-down restaurants you will find that the most authentic Vietnamese dishes still hold onto their rustic and humble beginnings. 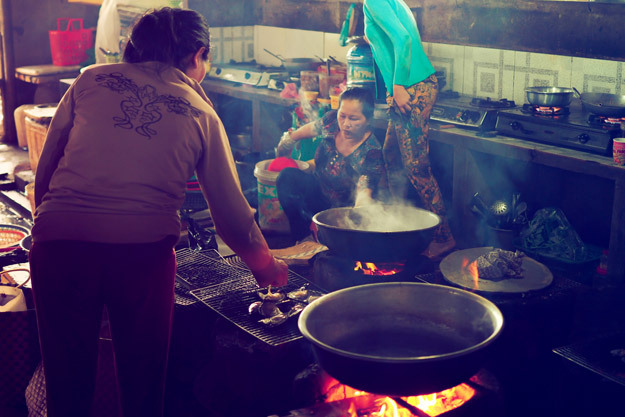 Dinner is the main meal of the day in Vietnam, where the whole family gathers together to enjoy their food. It is tradition to share food, so meals often come out in numerous smaller dishes or plates that can be passed around. If you are eating with Vietnamese people, it may be worth considering some basic etiquette. “If in Vietnam you’re confronted with a menu you don’t understand a word of, my best advice is not to worry too much! It’s probably all delicious,” said Marek. “Point to something and go ‘that one’. Vietnamese cuisine is simply one of the best in the world,” said Marek, who created his own travel guide. While we agree with Marek in that you’ll be sure of a delicious meal, if you are travelling with an allergy your biggest worry is understanding what exactly is in your food. No one should feel confined or even at risk when sitting down to eat. Therefore, we have compiled a short list of common phrases that can help when eating with an allergy in Vietnam. Nuts in particular are very widely used in South East Asia, with peanuts accompanying many dishes from salads to stews and grilled options. Elsewhere, seafood is one of the most common ingredients so remember to check all menus and ask before trying. To get a true taste of Vietnam you need to be open-minded. Be willing to try new things and be willing to visit places you never would have considered before. You can be sure to have an unforgettable culinary experience from the street food alone. Remember to always follow the crowds because after all, if a place is busy then it must be good. Avoid playing it safe with sit down, formal restaurants and immerse yourself in the culture of the city or town. Sit with the locals outside the food vendors and enjoy what the locals eat. 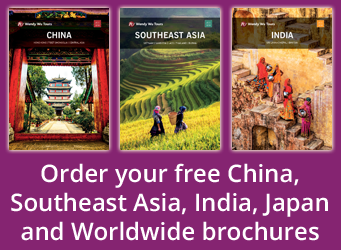 Book an award-winning holiday to Vietnam with the Asia experts, Wendy Wu Tours. 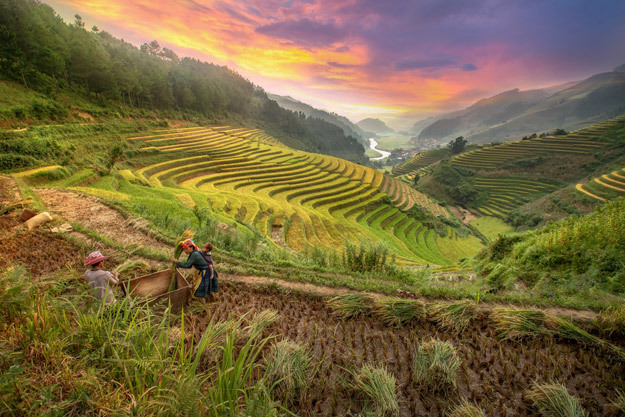 Our escorted Vietnam holidays visit all the major sights of this great country for an unforgettable holiday. Vietnam culture, food and drink, vietnam news. permalink. Thanks for your post! “Goi” is the word used by people in Southern Vietnam whereas “Nom” is used by locals in Northern Vietnam.